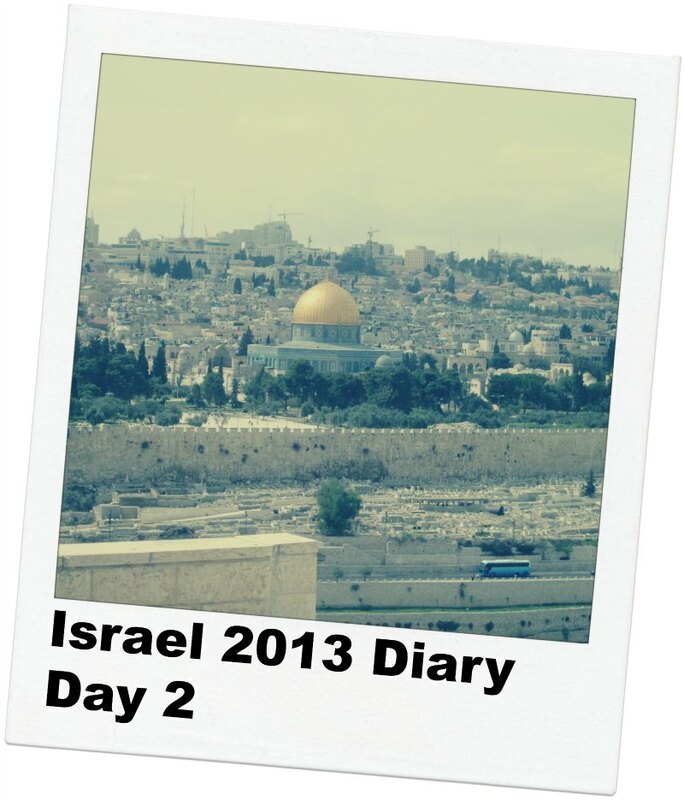 The second day in my Israel diary, where I’m attending the HP Indigo VIP Event in Tel Aviv. See Day 1 in Tel Aviv here. I awoke at 3:30 AM, fully aware that it was too early to get up, but unable to coax myself back to sleep. So around 4:30 I gave up, and resorted to responding to emails and checking the news. At 6:30, the hotel’s breakfast opened, which provided a wonderful array of options. The display reminded me of being on a cruise — so many yummy things to try! After eating and pounding a few cups of coffee, I made my way to the front of the hotel to wait for a tour bus (which I arranged the night before). I choose a tour of Jerusalem and Bethlehem, which cost around $90. Compared to what I’ve paid in other countries, it wasn’t too expensive. Promptly at 7:20, our tour guide (Absalom) appeared, requesting that I follow him to boarded his tour bus. He was a friendly and very helpful guide, and when I return to Israel, I’ll definitely look him up again. After picking up a few more tourists, we made our way for about 45 minutes to Jerusalem. I made friends with a number of my fellow passengers, including an attorney from Ohio, and an auditor for Shell. We passed a street corner in Jerusalem where Absalom said that 16 years ago a suicide bomber struck. I turned and saw a regular looking corner in front of a store. Didn’t really look like what I imagined; I’ve included a picture in the gallery below. Crossing into Bethlehem was interesting. I’m so naive — I didn’t realize it is on the other side of the wall. After walking through a series of connected passage ways (reinforced by thick concrete) and turnstiles, we emerged in Bethlehem. The first thing we saw were a number of taxis, and young men hanging around chatting with one another. We were directed us to another bus, which we boarded with a new guide.This guide took us to the Church of the Nativity, which sits atop what’s believed to be the birthplace of Jesus. Outside the church were several black SUVs, which our tour guide said were US Secret Service, preparing in advance of President Obama’s visit next week. Obama will be visiting the same location as part of his trip to Israel. It was breathtaking to see the Garden of Gethsemane, the Old City, and the Mount of Olives all in one view. It was difficult for me to comprehend and re-assemble mental pictures drawn from years of artistic renditions, movies, and my imagination. I almost found it impossible to process in the moment. The air in the area of the Old City was crisp, with clouds hanging about and moving slowly across the sky. It felt as if it could be any cloudy day in Orange County, except for the ancientness of what lay before us. Walking the Stations of the Cross was also interesting. It reminded me of being in Tunisia, which my wife and I visited during our honeymoon, except the vendors were far less pushy and much more reserved. I don’t think I got approached once to buy something. It is interesting to be at the physical intersection of three monotheistic faiths, each with overlapping claims to various sites as well as their own uniquely held beliefs. More thoughts on this in another post. Later that evening, I left the hotel around 7:00, and wandered down Pinnes street to Shabazi. Shabazi is lined with shops and places to eat, each with their own feel. I slowly wandered the street, enjoying the warm evening, sites, and sounds. I settled on Lulu Kitchen & Bar on Shabazi 55, which had an incredibly good chicken & vegetable meal. With a series of outsides tables and a two-story interior, the ambiance was relaxed, casual, and I would definitely return. I ended up doing some writing at the table, which proved to be relaxing. After finishing my meal, I continued hanging out, thinking and trying to absorb the day’s events. Here are some photos from day 2. Click to enjoy! Absalom, our tour guide. Nice guy! This is where a suicide bomber struck 16 years ago. In advance of the President’s trip next week, we saw a lot of signs like this one. We parked the tour bus and exited here. This is where we started our walk into Bethlehem. The guide said that the neighborhood in the distance used to be very dangerous. Once we were in Bethlehem, we drove near the wall. The wall is covered with lots of art like this. According to many I spoke with, the wall has saved many lives. I saw lots of drawing like this. Not sure what they are. A very small door leads into the church. It really is very small. United States Secret Service. I felt pretty safe. Lots of people were waiting to get to the area where Mary is said to have given birth. This is the spot where Mary is said to have given birth! This is inside the Church of the Nativity. Many people were on the ground worshipping. This is the spot where Mary is said to have laid Jesus after having given birth. Outside the Church of the Nativity. Another shot of the hill … shouldn’t we pick up the trash? Inside the kibbutz; was tasty! So strange to see “Mount of Olives” with “bazaar”. In the Old City, there were parts we couldn’t go any further. These young looking guys had serious looking weapons. Strangess thing ever — an Elvis restaurant in Bethlehem. I saw the King in Bethlehem! 2. I was visiting yesterday (Saturday) in Bethlehem of the Galilee, an ancient place that appears in the Bible. The modern village was founded by the Templers in 1906. It’s an amazing story combining religion (Protestants Christians) and nationalism (German Nazis!) in the Holy Land in the days of the Ottomans and later the British. Anyway it’s a beautiful place. See http://en.wikipedia.org/wiki/Bethlehem_of_Galilee. The relevant part to your visit is that there are some historians who claim that actually Jesus was born there! To support their claim they ask how a woman in her 9th pregnancy month can travel from Nazareth to south of Jerusalem?